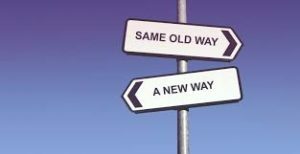 DNA Has Changed My Habits…and not for the good, I’m afraid! I have made public several trees that are quite large. The reason for their size is because I once did surname studies – I tried to link all of the Leiningers, Harbaughs, Duers, Kos[s]s, Landfairs and Kuhns in the U.S. from an identified gateway ancestor. I want contact from far flung relatives as I don’t know these folks personally and needing closer relatives input, I made the trees public. Due to the many places I’ve placed the trees online, their size, and my weekly blog posts, I get over 500 comments weekly. Granted, many are spam, but quite a few are serious inquiries. Before DNA, I would go to the tree mentioned, search for the name provided in the inquiry, review what citations I had and then respond. Since DNA, I find myself instead responding with my own query – Have you had your DNA analyzed and if so, what provider did you use and what is your profile name? Last evening, after sending the same question repeatedly, it hit me that this is a seriously lazy response to well meaning folks who’ve taken the time to contact me. My intentions were never to be rude but I’m afraid that’s how it’s appearing. I’m not sure how I’d feel if I was the recipient and wasn’t into DNA. I queried colleagues in my local genealogical society and they think my response is acceptable but I’m not so sure. What do you think, readers?! Would you be offended if you emailed someone for more information and received a question in response? 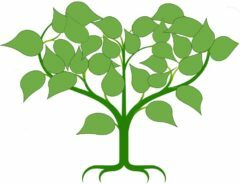 Author GenealogyAtHeartPosted on April 14, 2018 Categories Trends and Musings, UncategorizedTags DNA, Duer, Harbaugh, Kos, Kuhn, Landfair, LeiningerLeave a comment on DNA Has Changed My Habits…and not for the good, I’m afraid! Life has returned to semi-normal after the recent hurricanes. By semi, I mean the county still hasn’t collected the debris, milk and gas aren’t available everywhere and several parks remain closed due to damage. When our power was out for several days, I limited my internet usage to conserve my cell phone battery. It wasn’t until I went to clean my spam filter for my website, Genealogyatheart, that I discovered a message from a distant cousin. He had discovered my site and our connection through our great grandfather by simply Googling the last name. I replied to his comment and he included one of his nieces on our messages. Between the 3 of us, family puzzles began to be solved quickly. In the past week, I discovered that my paternal grandparents had hosted a small family reunion at their farm in the 1960’s. My parent’s divorce was finalized by that time so my mom knew nothing of the event. Without my cousins input, I wouldn’t have known about it, either. That got my brain going about unidentified people on an old movie I had inherited from my father. Hubby and I have had all our 8 mm films and VHS tapes professionally saved to a DVD. (Side note: If you think your VHS tapes aren’t so old they need to be saved, think again. The oldest VHS tape from 1984 was fading away while some of the 1950 movies looked as good as new). The DVD contains still photos of some of the movies so hubby took those of the mystery people, along with another CD we had made of all the old family photos we had scanned years ago, and sent them off to both cousins for help in identifying these unknown folks. We’re fairly certain that the picture above is of my grandmother, Lola, and her older brother, Stanley. Why? I have the photo and they have the photo. 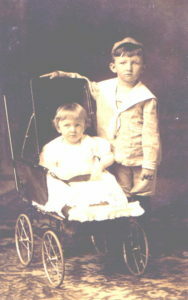 They are descended from Stanley and it was in their box of photos of his family. My step mother had placed all the old photos in one box so I was never sure who any of my unlabeled people were. Were they a Leininger, Landfair, Kuhn, Kable, Kettering, Bollenbacher, Adams or Duer? I had tried the old Google Picassa facial recognition feature and it helped somewhat but I didn’t have enough identified photos to have it match effectively. These cousins sent me a few other photos electronically over the past week to see if it would help but Picassa is no longer supported by Google and it kept freezing so no answers there! I’m hopeful they’ll be able to match some of the photos on the CD to photos in their box so at least we can categorize by surname. The cousin who initially contacted me stated their tale is that the family originated from Ireland and not Bavaria as my line recalled. I tend to believe them for several reasons. I’ve had another family member misidentified’s country of origin as Germany instead of being born in the U.S. Maria Duer Kuhn’s death certificate states she was born in Germany but she was born in Ohio. Her son was the informant. Her husband was the one born in Germany. It seems like my Great British ancestors assumed the German culture of those they married in Ohio. Additional support for their story is that my DNA has a much higher likelihood of Great Britain then it does of German. Further, Landfair is not a German surname. When I questioned that years ago I was told that it probably had been changed from Lamphere. Could be but no proof of that was ever discovered. One of the cousins also has a copy of my great grandfather’s funeral program which she will send me. I’ve blogged about him previously – he’s the gentleman who “accidentally fell from a platform” and there was a followup investigation a few months after his death resulting in additional paperwork after the death certificate. The lesson there was make sure you get the complete records you request. This gets me to the point of today’s blog – there remains A LOT of additional information about your ancestors out there – in attics, basements and the brains of the living who recall the unrecorded stories past down. The internet can help you get to those that hold the key you need but alone, the internet is not enough. Reach out to long lost family and you just might discover the info you seek. Happy Hunting! I’m not sure what it is about holidays – maybe it’s the food, knowing time away from work is coming or the spirit of the season but I’ve learned that when I have a needed record to obtain those are the best times for me to secure it. January – Last year I was writing a Kinship Determination Paper for by Board for Certification of Genealogists portfolio on the Harbaugh family and I needed clarification about their religious beliefs. 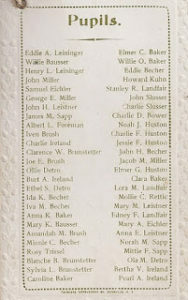 Most of the first generation was buried in a Lutheran Cemetery in Indiana but the second generation was buried in a Brethren Cemetery. I was trying to understand when the change occurred so I called several churches in the area during the Christmas season seeking parishioner records from the 1880’s. The timing was wrong – churches are extremely busy then. I followed up via email in January and reminded them of the prior phone call, mentioned I hoped they had an enjoyable Christmas and before they got busy with Lent, would love them to check their parish records for me. It worked! By Valentine’s Day I had pictures of relatives I had never seen, a copy of the parish record book, an understanding of why the family went to a different denomination (it was across the street from where they lived) and a diary on DVD in which a parishioner had recorded daily life in the area that just happened to record ALL of the births and deaths of the family I was searching. January is for me, the best time to obtain church records! February through Easter and October through December- This might not work for those somewhere other than Florida but I find those months the best time to meet folks from New England, Mid Atlantic and the Midwest as they are temporary residents here and frequently attend local workshops. So, if you’re residing in those locals then do this on the months I haven’t recorded! I pick their brains on resources from their home area, get leads on people back home they know who might help with my research and sometimes, meet a cousin. I’ve blogged previously about a serendipitous meeting I had in October 2016 (Less Than 6 Degrees of Separation and December 2015 A Transcription Treat). March – April and November – I don’t know why these seem to be less busy times at archives but I’ve always found that the staff was readily available to help and the sites sparse with visitors. I’m talking about the Family History Library in Salt Lake and the New England Historic and Genealogical Society in Boston. I guess most researchers are either on spring break in a warmer climate or too busy getting ready for Thanksgiving during these times leaving the facility vacant. I’ve also had quick responses from state libraries via email during these months. May – September – Need a tombstone photo? This is the best time to get one! Why? Simply because people visit cemeteries most between Memorial Day (duh!) and Labor Day. Put a request for a photo on Find-A-Grave a week prior to Memorial Day has almost always gotten me the photo I need. Think about it, who in their right mind would go out in a blizzard to take a cemetery photo? Well, yes, I would and have but that was because I was visiting the area and wouldn’t have gotten another chance to find what I needed. If I lived in the area, I would wait til the snow melted. Thanksgiving – December – I was pining for the marriage record for one of my 3rd great grandparents. It’s not online and I needed to verify the date I found in family records as some of those were slightly off. I had called the small town in Ohio Clerk’s Office in August and was told to follow up with an email. I gave the couple’s names, dates of birth and what I thought was the marriage date. Two weeks went by and I didn’t hear anything so I emailed again. I got a response that the clerical workers were too busy. Waited another two weeks and emailed once more. Got the response that they were still busy and wouldn’t have time to look it up. Emailed the office manager and got no response. I left the email as open in my email account as a reminder I needed to pursue it. Well, on the Monday before Christmas I sent the following: Dear (clerk’s name), I’ve been a good genealogist this year and I’m hoping that you can assist Santa in bringing me the marriage record for my great grandparents – Emma Kuhn and Francis “Frank” Landfair. It’s all I want for Christmas! Wishing you a joyous season, Lori” I got it the next day. The response also explained why it’s never been scanned and online – evidently the book is in poor condition and won’t photograph well. I’ve also used a similar tactic the day before Thanksgiving. I called a cemetery for records and the office worker finally agreed to fax them to me because I told her I was having family over the following day and we just had to know who was buried in which plots. This cemetery is located in a not so nice area so I never could get anyone to take a photo and the clerk had previously refused to release the info due to privacy previously. (BTW-the dead don’t have privacy rights but she was insistent the cemetery rules prohibited her from releasing the plot information). Hope this helps your hunting as you plan your research for the year! Originally published on genealogyatheart.blogspot.com on 22 Dec 2015. For some reason, I didn’t receive the document from the Board for Certification of Genealogists (BCG) that I am supposed to transcribe. After waiting 3 weeks I emailed and was told the day it had been sent. BCG staff was going to resend if I didn’t receive it by the end of that week. Nearly a month after it had been mailed it finally arrived with no postal markings and it looked like it had gotten stuck in a machine as a side was torn. The contents, though, were fine. Since it arrived the day before I was to fly out to the west coast for business I put it aside until this week. Last Friday, I decided I would drive to the county mentioned in the document on Monday and locate the original so I called to check the time the office would open. With holiday closures one never knows! This led to several phone calls and messages left. I received a call mid day Saturday informing me that the office would be closed Monday but they would be open on Saturday until 5:00. I was running errands but dropped everything to drive the 2+ hours to get there before they closed. I am so glad I did! When I arrived there were only 2 people staffing the archives, a paid employee and a volunteer. After seeing the document and photographing it, the volunteer asked me why I had wanted to see that particular record. I told her about the certification process. We continued talking and she mentioned her home state which happened to also be mine. Turns out we’re related in 3 lines (Lamphere, Kuhn and Duer) through our great grandfathers! If you’re a faithful reader you know I wasn’t close to my dad’s side growing up and have never met any of his relatives so this meeting was especially sweet. What makes it even better is the lesson that persistence pays! My first call was to the courthouse but I was told by the operator that they didn’t have old records and I needed to call a different office. The next office staffer told me that all of their records were online and the originals had been destroyed. When I pointed out that the record I was looking for wasn’t online the clerk didn’t know what to say. She suggested I called the historical society. The first person I spoke with there said she had no idea where the record I needed was and she would have someone call me back. I waited a few hours and called again. That’s when I learned she had left for the day. The person I was then speaking with told me that the historical society only had microfilm and that the originals were at the courthouse. I asked who I should speak with at the courthouse as that was now bringing me full circle because that’s where I first called. She suggested I check with the records department. Unfortunately, the records clerk had to check with an older employee as she had no idea what I was talking about. The older employee wanted to know why a fortune teller wanted the record. Huh?! Evidently the girl I spoke with didn’t know what a genealogist was and thought it was some kind of fortune teller. Clearly I’m not a fortune teller or I would have knowledge of where I’d find this record! We both laughed about the misunderstanding. We left it that I would come on Monday at 8 AM but I should be prepared that the record wouldn’t be found. I packed what I needed in my purse in preparation but wasn’t particularly hopeful. When I got the call on Saturday that the record was available I couldn’t believe it. That alone would have made my day but to meet a relative who just happened to switch her volunteer hours due to the holidays, well, I think this was meant to be. I’m on my way to the post office to mail my new found relative copies of my records and then on to the airport to pick up family so I’m posting my Thursday blog early. Wishing you and your family love, hope and good cheer this holiday season! Originally published on genealogyatheart.blogspot.com on 4 Oct 2015. Today an important event is happening in our nation’s capitol – 600 organizations are uniting to take a stand concerning a serious problem that must be addressed in our country. UNITE TO FACE ADDICTION is focused on finding ways to help the 22 million Americans who are addicts, 23 million who are in recovery and put a stop to the death toll of 350 individuals a day who die from addiction related causes. Dependency on drugs in the U.S. is not a new problem and my family, like scores of others, have been affected. The Washington Post recently published an article on current research in the field. “… addiction — to drugs, alcohol, or any other destructive habit — doesn’t come as the result of some personal failings. Its the result of some pretty serious brain chemistry.”1 Unfortunately, for generations, families have felt the need to face the problem in secret due to society’s repercussions and erroneous beliefs that addicts are people who simply make poor choices and lack willpower. I applaud the millennial generation who are getting the message across that is not the case. Addiction is a disease and effective treatment is possible. The 1910 US Federal Census shows Grandma Emma Kuhn Landfair as divorced. Was the divorce due to the conviction or was Frank Landfair also an alcoholic and the conviction was the last straw for Great-Grandma? Although we may never know for sure, Frank’s brother, Charles, experienced his own problems with addiction. Charles’ issues with alcohol led to a divorce, loss of his medical license and a prison sentence. I can find no documentation that 3 other brothers who survived into adulthood were affected by the disease. Thinking about the siblings, I’m thinking that’s why many people today do not view addiction as a disease; when one sibling is an addict people think, if addiction is truly a disease, than the others siblings should also be addicts. That’s faulty reasoning. My mother’s two sisters had breast cancer but my mother did not. Everyone would agree that cancer is a disease. Why the assumption is often made that every family member would be an addict is erroneous but the believe exists. Let’s hope that the millennials are able to finally move forward regarding acceptance and support of individuals who are or have experienced addiction. It’s time. 1Feltman, Rachel. “The Sinister Science of Addiction.” Washington Post. The Washington Post, 14 Sept. 2015. Web. 04 Oct. 2015. 2 The Lima News 3 Jul 2009 Accessed through Newspaper Archives Web 20 Feb 2010. Originally published on genealogyatheart.blogspot.com on 20 Aug 2015. Education was extremely important to my Leininger lines and I have an interesting story to share about my gateway 3 times great grandparents, Jean “John” (20 Nov 1801-1 Dec 1868) and Margueritte “Margaret” Gasse (27 Jan 1801-4 Apr 1886) Leininger who emigrated from Endenhoffr, Alsace-Lorraine, then Germany to America in 1827. Previously, I’ve blogged about what a difficult trip it must have been for the family but the following story illustrates how quickly they acclimated to the “rules” of America and bent them for the benefit of their children. The family emigrated with 2 sons – Theobald and John George. Settling in Stark County, Ohio the family grew, adding sons John and Jacob. 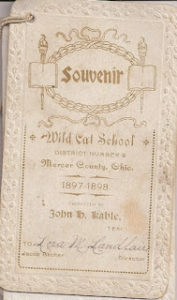 In 1835, the family relocated to Mercer County, Ohio. GGGgrandpa opted for a career change from blacksmithing to farming. Sons Henry and Samuel were born after the move. On July 1, 1839, John purchased 128.60 acres of land in Wabash Township, Jay County, Indiana with an additional 8 acres of land on the adjoining Ohio side. John then built a home across the state line. This benefited the family greatly as they could easily relocate from Ohio to Indiana and back to Ohio without ever leaving their home. They simply moved their furniture from one side of the house to the other. Why would someone do this? Family lore says it’s because of the variation in educational opportunities. When the school teacher left Mercer, the children could easily continue schooling in Jay, and vice versa. Personally, I think this was ingenious and says so much about how the family valued education. They were in the forefront of the School Choice movement! I’d love to visit the home but it was destroyed by fire in 1970. My dad pulled the same stunt in the 1960’s. His farm was on the county lines of both Lake and Porter in Indiana. He preferred the Porter County school district so my step sibs were sent to Porter County schools. Technically, the house was built on the Lake County side so I’m not sure how he got away with it. My great great grandfather, Jacob Leininger (11 Nov 1832-Jul 1908), served as town trustee and a long term school board member in Mercer County, Ohio. I guess he preferred the Ohio to the Indiana schools after he grew up! My great grandmother, Emma Kuhn Landfair (20 Jun 1864-21 Feb 1914) and grandmother, Lola Landfair Leininger (27 Apr 1891-30 Jan 1964) were teachers for a short time before their marriages. School must have been important to them as they saved their remembrance cards and all of my dad’s report cards. The above school Souvenir was for my grandmother Lola’s 1st grade year. Her teacher, John D. Kable, would become her 2nd cousin through her marriage to my grandfather, Edwin Leininger. Edwin’s parents were Theobald Leininger, son of Jacob the School Board member and Caroline Kable. 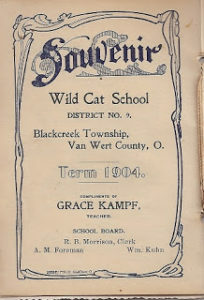 Caroline’s brother, John, had a son, John, who was the teacher at Wild Cat School (above). My husband and I are high school sweethearts. It’s an awesome thought to think that my grandparents were grade school sweethearts! 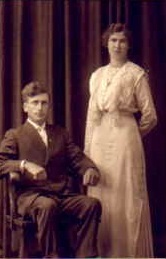 All grown and graduated, Eddie and Lola (above) married in 1914. 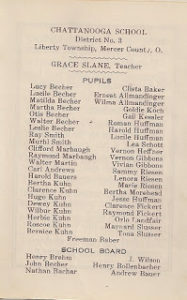 The Bakers-Kuhns-Landfairs-Leiningers all intermarried for several generations so many of the classmates were also related. William Kuhn was my grandmother, Lola Landfair Leininger’s uncle. It’s an amazing thought to reflect on the amount of impact the Leininger line had on education at the turn of the last century!